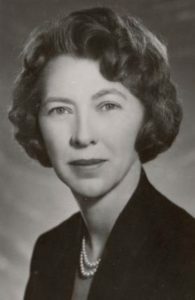 Florence Lee Jones Cahlan was a journalist, civic leader, and historian who contributed to Las Vegas at mid-century by writing about and preserving the region’s history. Born in 1910 in Missouri, Florence Lee Jones spent her youth in Missouri, California, and the Dutch East Indies as her father worked for the Dutch Shell Company. She attended the University of Missouri and graduated with a degree in journalism in 1933. Jones moved to Las Vegas following her graduation and worked as a cub reporter for the fledgling newspaper, the Las Vegas Review-Journal. She was the first professional woman journalist on staff and the Associated Press correspondent at the paper. Jones became a permanent reporter at the paper and was mentored by John Cahlan who, with his brother Al, was instrumental in the growth of the Review-Journal. In 1940, Jones married her mentor John Cahlan. The couple shared not only a love for journalism, but had mutual interests in civic activities, promoting Las Vegas, and learning and telling the local history. Jones Cahlan also involved herself in community. She was a charter member of the Service League and a board member at both the Clark County American Red Cross and the United Fund. She also worked to improve the lives of the blind and handicapped. She joined the Jaycees despite a national rule barring women from membership. Her love of Las Vegas and its history was reflected in her newspaper column on early Las Vegas life and her work establishing the Southern Nevada branch of the Nevada State Museum and Historical Society. She wrote several articles and books on the history and growth of Las Vegas. She also collaborated with her husband on the book, Water: A History of Las Vegas (1975). The honors awarded her include being named one of the ten most influential women by the Las Vegas Review-Journal and being named Woman of the Year. She passed away in 1985. Source: Looking Back at Nevada Women presented by Clark County Parks and Recreation with the Women’s Research Institute of Nevada, 2001. Photo courtesy of UNLV Special Collections. May not be reproduced without special permission of UNLV Special Collections.